THE BAD NEWS ABOUT THOSE FRACKING JOB CLAIMS IN THE US JUST KEEPS ON COMING – wonder what that means for all the South Africans that Shell, Econometrix and Mr Zuma have promised jobs from fracking? Report shows decline in gas-drilling jobs and overstates the number of workers supporting natural gas industry. HARRISBURG — As executive director of the Wellsboro Area Chamber of Commerce, Julie VanNess was front and center when energy companies descended on Tioga County to secure drilling leases on pristine land around Routes 6 and 660 through Pennsylvania’s Grand Canyon. “I don’t have a negative feeling for the industry,” VanNess said. The industry was accommodating and respectful of the community’s needs and understood the importance of its tourism industry, VanNess said. It fixed long-neglected back roads to handle rigs, rerouted drivers away from Wellsboro’s tony downtown and kept trucks away from schools during class time, she said. With leases signed and wells operating, the companies have pulled back resources amid what had been until recently a downturn in natural gas prices. Many of the out-of-town workers who filled hotels and restaurants in and around Wellsboro have left, too. It’s the same story in many of the 32 other counties where drilling began in 2004 to extract natural gas trapped in the underground Marcellus and Utica Shale formations: Fewer jobs and less overall economic activity, despite a record amount of gas — 3.1 trillion cubic feet — produced in 2013. The industry has declined, Williamsport Mayor Gabe Campana said, but it’s still alive. Without it, the unemployment rate in his third-class city of 35,000 would be 10 percent and he wouldn’t have four new hotels downtown. Gov. Tom Corbett praises the natural gas industry as a key cornerstone of the state’s economy. “It’s lifting up entire communities, creating and supporting many thousands of jobs well beyond gas production,” Corbett said in his Feb. 4 budget address. But state records show the gas industry has not created as many jobs as state officials have claimed. In addition, the state’s estimates of ancillary job growth have been inflated to include employment in places drilling isn’t even taking place, further skewing the impact the natural gas industry has had on employment. The number of jobs directly associated with Marcellus Shale’s six “core industries,” including drilling, extraction and pipeline construction, declined by 29 percent to 29,926 between the fourth quarters of 2010 and 2013, according to the state Department of Labor and Industry’s January labor report. The report is based on employer surveys collected for federal unemployment data and has been produced using the same analysis since Gov. Ed Rendell‘s administration. The number of core gas jobs accounts for less than 1 percent of the state’s nearly 5.8 million jobs. Corbett spokesman Jay Pagni defended the administration’s record on jobs in the shale industry and its training efforts. He said the state and governor support all forms of industry equally, and has numerous programs to help train workers in the event of a downturn in the local economy or job sector. All industries go through a natural cycle, Pagni said. The workforce and activities associated change and adapt, he said. While the core Marcellus Shale jobs are declining, the Labor Department claims the number of ancillary jobs indirectly tied to the natural gas industry has increased 8 percent to 212,000. But that increase is not based solely on employment trends in the counties where more than 7,000 wells are permitted to be drilled. The report includes statewide employment trends in trucking, engineering, highway construction and about two dozen other career sectors. So jobs in the Lehigh Valley, Philadelphia and other areas where there are no wells have been counted as ancillary gas jobs. Labor Department spokeswoman Sara Goulet defended the report, saying the data on core jobs show a concentration of drilling, extraction and construction jobs has increased in the state’s northern tier and southwest corner, where drilling is being done. But trying to quantify the ancillary jobs data is hard, Goulet said, because the number of ancillary jobs has increased in the drilling regions, too. But since there is no way to determine if the jobs are tied to the gas industry, she said, it makes sense to list statewide employment numbers. The shale industry is creating support jobs statewide even if they are in Delaware County, said Kravis Windle, a spokesman for the Marcellus Shale Coalition, a trade group in Pittsburgh. There is no question the drilling industry has had a positive impact in communities, said Mark Price, a labor economist with Keystone Research Center, an economic policy group with ties to several labor unions. The Labor Department report on core drilling jobs does a good job of capturing that impact through its employment report of the gas industry, he said. But the ancillary report is bloated and useless, Price said. The shale industry has led to more engineering and trucking jobs, he said. But it’s hard to believe every engineer or trucker in the state is working in the gas industry as the Labor Department reports, he said. “The ancillary is gobbledygoop,” he said. The Labor Department cannot publish a county-level jobs report because of privacy issues, Price said. The report would be so narrow it would be easy to identify companies by name, which would violate private unemployment rights, he said. With that legal difficulty, Price said, the state should not publish a statewide ancillary report because it cannot accurately track which jobs support the shale industry. A dilemma of extraordinary proportions confronts world leaders as they wrestle with ‘the fraternal twins of peril and opportunity – typically the choice between economic growth and sustainable progress. This article intends to make a case for cautious investigation (critical thought)– a science-based analysis of the actual experiences that must ultimately inform policy – it is not a blanket statement that proponents of shale gas mining are wrong or that the converse applies. Spanning cultures and continents, shale gas is typified by a commonality of benefit and risk. Energy, jobs, revenue, and the reduction of greenhouse gas emissions are four key areas that arrest the attention of any government. 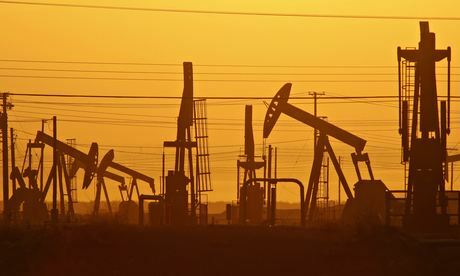 Stacked against the elephant in the room – the risk of environmental, and ultimately economic damage – these considerations project shale gas into a ranking as the most widely debated fossil fuel in more than two hundred years. Four primary areas define the broad environment in which we approach a discussion on shale gas: community, environment, development and sustainability. Interdependent and universal, each is of itself and in relation to its counterparts, undeniably central to the survival of humanity. It follows logically that a review of shale gas mining commences with acknowledgement of the dynamics driving its development. Barely ten years ago shale gas was unknown in the realm of many governments and in the minds of a majority of people – speculation over Peak Oil and the end of the fossil fuel age was endemic, and Oil & Gas companies were turning to ever more expensive and risky sources of carbon – colloquially labeled extreme energy. If economics informs government opinion, the touchstone of the ‘prosperity’ argument is development, with the measure of GDP naturally pegged as the definitive gauge of the health and wealth of a people. Economists predominantly calculate growth projections on what has been, and remarkably – even in the face of the global resource debate – still produce reports that refuse to even acknowledge the environmental and social costs of specific developments. Despite the advent of environmental economics based theory and supporting documents penned from within the economist community, modern economics in practice appear to have had little effect in modifying the GDP-based clarion call of ‘upward and onward.’ A 2009 report from Boston University, states: “GDP is dangerously inadequate as a measure of quality of life,” yet within the context of shale gas in South Africa it is largely the anticipated contribution of shale gas mining to GDP that has elected officials already revising GNP, jobs and economic growth forecasts. Vast numbers (R80-R200 billion) and substantial percentages 3.3%-9.6% of GDP abound. Unsurprisingly the government appears to accept, apparently at face value, the predictions of economists paid by Oil & Gas multinationals. Meagre attention seems to have been expended on the base model applied to develop such numbers, and divergent opinions generated by well-published economists are greeted with silence. The notion that exponential global growth, fueled by traditional energy sources will meet the needs of humanity is ingrained and commonly accepted to the extent that it is claimed by some that the world is not running out of resources. Professor Emeritus of Earth Sciences at the University of Melbourne, Ian Rutherford Plimer credits the greatest carbon emissions as emanating from Australian brush fires and active volcanoes. Denouncing efforts to address anthropogenic causes of global warming – and in fact the holistic concept, Plimer gives the idea that there is little that we can do except sit back and enjoy the ride. ExxonMobil CEO Rex Tillerson is ostensibly of the same mind about the outcome in his statement, “What good does it do to save the planet if humanity suffers?” Tillerson is reported to have said “We can’t pull up, we’re going in, brace for impact” – an analogy of the language that would be used by the captain of an airliner in a terminal dive. Making Tillerson’s statement even more baffling are reports that ExxonMobil as an organisation has invested heavily in climate change denial. Asserting that nine out of ten ‘top’ climate change deniers are or alleged to be linked to ExxonMobil, the report reviews the efforts of big industry, including the Koch Brothers to cement climate change denial. Pointing to 938 papers cited in an article by Carbon Brief , the text reveals that 186 of the articles were written by only ten men, and foremost among them was Dr Sherwood B Idso, who personally authored 67 of the articles. Idso is the president of the Center for the Study of Carbon Dioxide and Global Change, an ExxonMobil funded think tank. The second most prolific was Dr Patrick J Michaels, a senior fellow at the Cato Institute, who receives roughly 40% of his funding from the oil industry. Whatever the ultimate conclusion of the climate change discussion, two facts are undeniable – one – climate change is a convenient issue for both sides of the shale gas debate to use to their advantage; and two – big industry can throw tens of millions of dollars at it as long as it suits them to do so. Granting the last two points, (economics and climate change) are grounded in science, it is necessary to examine the term ‘science’ holistically, and with specific reference to shale gas in South Africa. 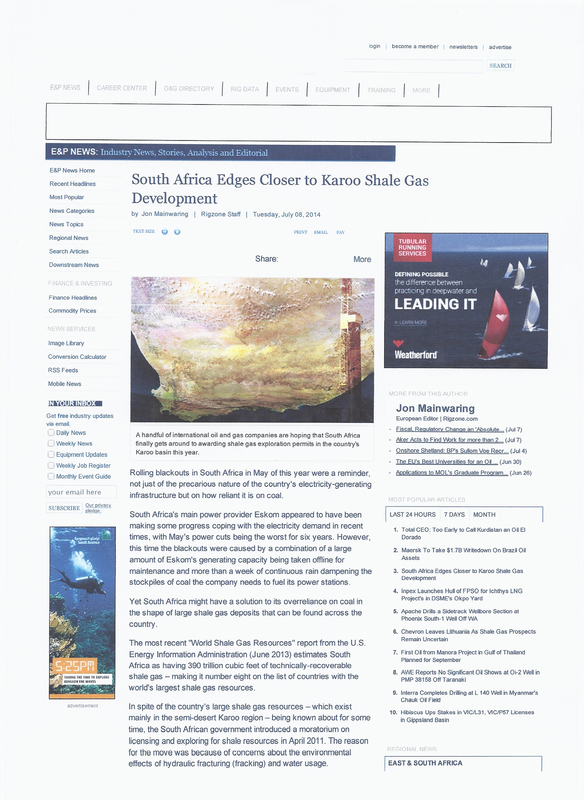 An assessment of the shale gas debate in South African media will establish that both sides make use of ‘scientific’ reports that suit their viewpoint. Plato, in Republic wrote, “When the mind’s eye rests on objects illuminated by truth and reality, it understands and comprehends them, and functions intelligently; but when it turns to the twilight world of change and decay, it can only form opinions.” The nexus with shale gas in South Africa is evident: the world’s scientific community cannot reach consensus on the claims raised by both sides of the shale gas argument. A Green Paper on the importance of “scientific evidence-based policy-making” published by Janez Potočnik; Commissioner for Science and Research at the United Nations describes a resilient method for approaching policy decisions, especially on large scale. Potočnik writes “… ’Bridging the gap’ between science and policy is not a technical issue. It is a political, economic, social and cultural issue. It is about an encounter between politicians and scientists, often with the necessary help of citizens themselves.” The United States Environmental Protection Agency affords scientific policy appropriate gravity in its own Scientific Integrity Policy affirming, “Science is the backbone of the EPA’s decision-making.” The EPA also describes ‘science’ as an expansive term that references the full spectrum of scientific endeavors – basic science, applied science, engineering, technology, economics, social sciences, and statistics. I don’t believe that South Africans can, at this juncture be shown that the Government policy on shale gas has been scientifically informed to the extent that a decision on a technology of the scope and scale of shale gas ought to be. Writing on the claims of climate change believers, a local journalist pronounces “This is simply bad science, conducted by scientists whose careers are on the line, paid for by investors with a stake in the outcome and politicians who want the moral cloak of playing saviour in a crisis. Clinging to received (sic) dogma, by repeating hoary arguments unilluminated by new facts demonstrates an abdication of critical thought that is not conducive to credible science.” On the basis that this statement applies equally to climate change deniers and their allies in governments – I agree wholeheartedly. According to the SA government, shale gas extraction can be done safely and economically, will bring great riches and prosperity to South Africans, and concurrently solve our energy and carbon emission challenges. 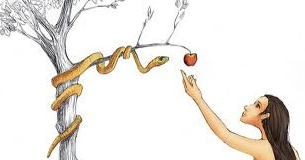 I don’t believe that our leaders have properly discharged their duty to the citizens of this country in arriving at their public decision on shale gas – and I submit that in election year it is time for you to think critically about whether to pick more fruit off the poisoned tree – or stop watering it. Gore, Al. The Future, 1st ed., Random House Publishing Group, New York. (2013). Stiglitz, J. E., Sen, A. & Fitoussi, J.-P. Report by the Commission on the Measurement of Economic Performance and Social Progress Vol. 12 (Commission on the Measurement of Economic Performance and Social Progress, 2009). Also Costanza, R., Hart, M., Posner, S. & Talberth, J. Beyond GDP: The Need for New Measures of Progress (Boston University, 2009). A label ascribed, within the context of the report, to the most prolific writers supporting climate change skepticism.